Regardless of your views of the Patient Protection Affordable Care Act (often referred to as ACA or more controversially as “Obamacare”), it was passed and is currently in the process of being implemented. Since the Affordable Care Act was intended to cover all uninsured Americans, this law will dramatically increase the number of limited English proficiency (LEP) patients who have insurance. This in turn will greatly increase the need for language services in all areas of healthcare. Along with the ACA rollout, come new provisions for LEP patients. These provisions include providing translations and interpreting services to LEP patients to increase healthcare access for all. The LEP population in the United States is not a small one. According to the 2011 American Community Survey Report, more than 60 million (21% of the US population) people speak a language other than English at home. Additionally, more than 25 million or (9%) can be considered LEP and speak English “less than very well” by their own admission. It is estimated that 8.5 million children under 19 years live with at least one LEP parent. The Kaiser Family Foundation in its Profile Of Health Insurance Exchange Enrollees has said that of the 24 million Americans expected to buy private health insurance, they expect 23% of all Health Insurance Exchange applicants to speak a language other than English at home. The ACA will multiply the number limited English proficiency individuals that have insurance and that use the healthcare system. Many provisions have been created Federally to enable LEP patients to have full access to our healthcare system. 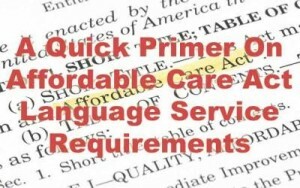 What Are The Affordable Care Act Language Requirements? 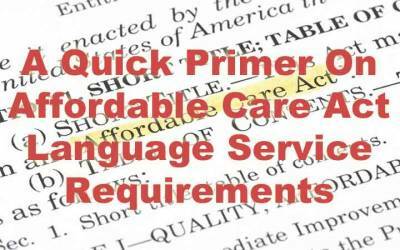 There are many federal regulations that mandate language services for limited English proficiency patients. The ACA extends previous mandates and explicitly requires insurers and healthcare institutions to provide written translation and interpreting services for limited English proficiency individuals of qualifying language groups. Below are the Federal laws requiring language services for LEP individuals. On August 11, 2000, President Bill Clinton signed Executive Order 13166, which requires federal agencies to examine the services they provide, identify any need for services for those with limited English proficiency and to develop and implement a system to provide those services so LEP persons can have meaningful access. Section 1557 of the Affordable Care Act builds on both Title VI and Executive Order 13166 and furthers protection from discrimination by including any health program or activity that any part of which receives Federal financial assistance including credit, subsidies and contracts of insurance. Section 1557 also extends non-discrimination protection to the Health Insurance Exchanges (as well as any other entity or Executive agency that administers a program or activity established under Title 1 of the ACA). What is the Threshold For Providing Language Services Under ACA? Using this established threshold, insurers and healthcare providers can calculate if they must provide language services, and for which languages. This threshold is estimated to affect 23 states and 255 counties nationwide. What Documents Must Be Translated? Along with providing a Summary of Benefits and Coverage, all health insurers must also provide a uniform glossary of common terms used in health insurance coverage. Every industry has jargon, and healthcare and insurance is no different. Have you ever tried to read and understand your health insurance policy? The Affordable Care Act requires all insurers to supply a uniform glossary to explain complicated or confusing terms associated with the health insurance provided. In order to develop standards for defining terms to be included in such glossaries, the National Association of Insurance Commissioners’ (NAIC) had to create a working group that included LEP representatives. When there are LEP individuals, insurers may have to make a translated version of the uniform glossary available in specific languages. The languages that are required for translating the SBC and uniform glossary are dictated by the threshold of 10% of the population having limited English proficiency. Providing patient communication in language the patient understands is designed to help all people better evaluate and understand health insurance choices, and to improve participation and outcomes in healthcare. Studies show that language services save money and resources when they enable LEP patients to understand and be engaged with their heathcare options. Language services boost medication adherence and reduce hospitalizations that result from misunderstanding prescriptions and medical directions. Hospitals and healthcare institutions should prepare for the increase of LEP patients that they must treat by putting language services in place. Recommendations for expanding language services include the following. Insurers, hospitals and healthcare organizations should begin expanding their language services now before the newly covered patients begin using their health insurance to access healthcare. This will reduce costs, improve healthcare and make them ready and better able to serve LEP populations that they will increasingly encounter.